At the construction site an important role is played by the availability of certain special equipment. 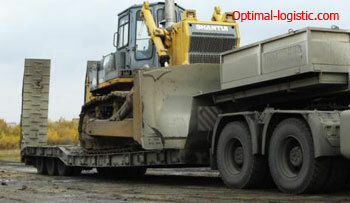 Optimal Logistic has extensive experience in the transportation of bulldozers and other construction equipment. The bulldozer is transported by us at the agreed time at the indicated address and at an affordable price. Fast registration of the order. Qualified specialists will accept your order and specify all details for the most convenient and fast delivery of the service. Calculation of the cost of services. We will accurately calculate the total cost depending on the dimensions of the equipment and the route. Safety of bulldozer transportation. We have in our specialized platforms – trawls, which are designed specifically for transportation of outboard machines. We guarantee the complete safety of the transported units. Fast delivery. Logists are working on the route depending on traffic on the roads, the presence of bridges and railroad crossings and many other factors to exclude all kinds of force majeure circumstances. Drivers have extensive experience in this field. unloading (the technique is unfastened and the safety of the parts is checked). We have been working for a long time in the field of transportation services for special machinery and appreciate our well-deserved good reputation. You can contact us by phone or via e-form at optim-logistic.com.